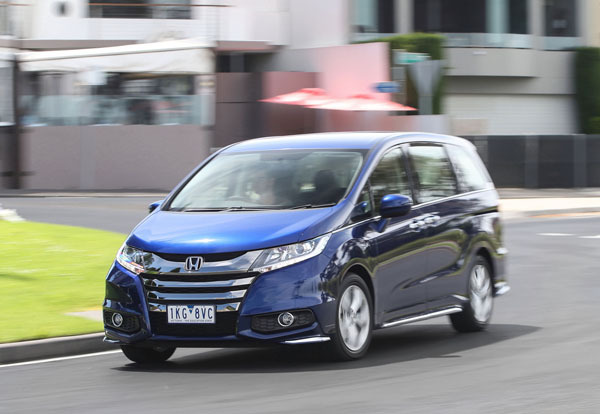 Honda Odyssey has been on sale in Australia since 1995 when the people mover was the vehicle of choice for those needing to transport more than five. For most of that period it’s been a three-way tussle between Odyssey, Toyota Tarago and Kia Carnival although the SUV phenomenon has taken many sales away from the segment. 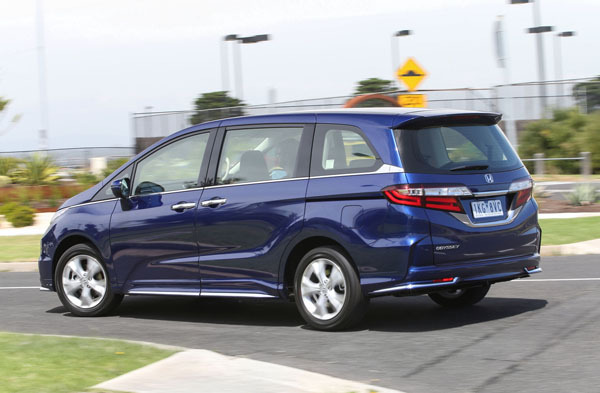 Honda made a bit of a gamble in its third and fourth generation model by lowering Odyssey’s height to make it look and perform more like a station wagon but with the arrival of the gen-five model in 2014 it’s reverted to its previous height of just under 1.7 metres. The MY2018 Odyssey gave it an external facelift, an upgraded interior and improved driver assist technology. Two variants are offered, VTi and VTi-L with the ‘L’ standing for luxury rather than a long wheelbase as used elsewhere. VTi now has the ‘aero’ front fascia design that was previously only available with higher spec VTi-L. It also now has bright chrome surrounds for the new front foglights. The VTi-L steps up to a new Solid Wing Face premium aero package with bolder bumper shaping, LED foglights and a dark chrome finish on both upper and lower grilles as well as the door handles. At the rear there’s a revised fascia and a stylish tailgate applique. VTi-L also gets a small sunroof over the front seats as well as rear door LED puddle lights.. Deep side skirts soften the appearance of Odyssey’s long sides. Two new paint colours have also been introduced for the MY18 Odyssey, with Cobalt Blue Pearlescent and Platinum White Pearlescent replacing Modern Steel Metallic and White Orchid Pearlescent respectively. The colours are offered on both variants. Odyssey VTi comes with eight seats while the more luxurious VTi-L has seven. The latter features twin buckets in place of the second-row bench in the VTi. The second-row pair have built-in adjustable footrests, reshaped headrests and seat-mounted storage compartments. The seatbacks can also be reclined and, when the third row seats are folded flat, the central seats can slide up to 740 mm forwards or backwards as well as laterally. So there’s a huge range of choice. The second and third rows in the eight-seater have three-way split seatbacks that provide a variety of seating and cargo options. The dashboard-mounted gearshift together with a pull-out storage tray and drink holders opens up the space between the front seats sufficiently to allow access to rear rows of seats. Conventional access to the rear seats is made easy through powered sliding side doors that can be operated either by touching the handles or using the key fob. The VTi only has the passenger sides powered, the VTi-L also on the driver’s side. With all seats in place there’s just 330 litres of rear luggage space, it can expand when the third row seats are folded (they fold completely into the floor) to 1332 litres and with the centre row down to a van-like 1867 litres. One noticeable omission is the lack of a powered tailgate even in the VTi-L. There is only one powertrain; a 2.4-litre four-cylinder petrol unit with peak power of 129 kW and top torque of 225 Nm at 4000 rpm. It drives through the front wheels using the greater efficiency of continuously variable transmission (CVT). There are steering wheel-mounted shift paddles that bring in preset ratios for drivers who don’t trust the automatic’s computer. Fuel consumption is listed at 7.8 litres per 100 kilometres; at 8.2 L/100 km we came reasonably close to during our test. These are impressive figures for a big seven-seater. Active safety features (crash prevention) in the Odyssey VTi include ABS brakes with brake assist and electronic brakeforce distribution; emergency stop signal; stability and traction control; hill start assist; daytime running lights; and tyre deflation warning. 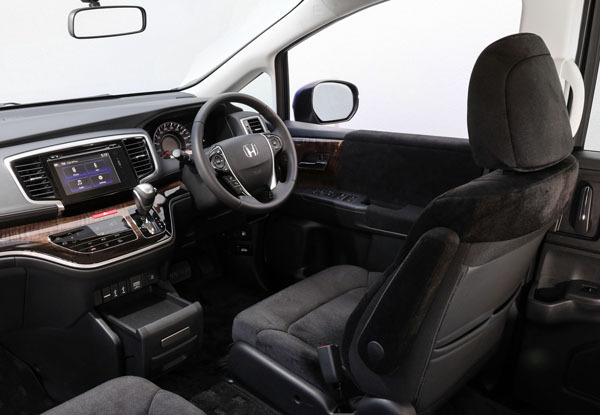 Passive features (crash mitigation) are front, side and full-length curtain airbags with whiplash mitigation front seats; and Honda’s Advanced Compatibility Engineering (ACE) structure. To get the majority of the advanced active safety features that are rapidly becoming standard in most cars you’ll need to pay the nearly $10,000 surcharge for the VTi-L. For that, you’ll get the Honda Sensing package which provides Forward Collision Warning; Collision Mitigation Braking System; Lane Departure Warning; Lane Keep Assist System; Road Departure Mitigation System; and Adaptive Cruise Control. VTi-L also adds blind spot monitoring; IsoFix child seat anchorages in the two second-row bucket seats; Smart Parking Assist; Rear Cross Traffic Alert and LED active cornering lights. Both variants have a multi-angle reversing camera with the VTi-L adding front, side and 360-degree top-down cameras. The Odyssey’s information and entertainment system uses a dashboard-mounted colour touch screen to display its infotainment range. It sits between air con vents and is quite small for a vehicle of its width and it’s not easy to use which results in far more inattention than is safe. There’s no Apple CarPlay or Android Auto and satellite navigation can only be accessed via a smartphone. Getting into and out of the Odyssey is a breeze regardless of your positioning within the car. There was no serious climb up or bending and head scraping, just a nice comfortable slide in. The downside to that is that the relatively low ground clearance does need a bit of caution at times on rough roads or getting on and off some driveways. With its large glass areas all round Odyssey has a lovely airy feel inside and provides outstanding exterior visibility. Engine start/stop is via a dash-mounted button although the parking brake is the ridiculous old-style foot operated unit. NVH (Noise, Vibration, Harshness) was one of the issues with previous Odyssey models but this has been improved noticeably with the MY18 Odyssey. The 2.4-litre motor revs freely and quietly through the rev range and the Odyssey cruises effortlessly and quietly with its strong torque over a wide rev range. The CVT is smooth with none of the annoying high revving of earlier units. Around town it behaves in a surprisingly sprightly manner, changing direction confidently while it cruises effortlessly on the motorway. The suspension generally copes well, but rough roads can cause it hassles at times. Handling really isn’t the reason you choose a people mover but the big Odyssey is safe and sure at higher than normal cornering speeds. In this era of crossover vehicles that attempt to be jacks of all trades it’s nice to review a vehicle that has one clearly defined purpose – to provide spacious, comfortable and economical transport for more than five occupants. Although not necessarily the market leader in sales Honda Odyssey has long been the queen of its class and the MY18 update sees it remaining there. Note: These prices do not include government or dealer delivery charges. Contact your local Honda dealer for drive-away prices.